A fast-moving Senate gave approval to critical “sunset legislation” after midnight Thursday, using two bills to extend the life of five state agencies held political hostage at the end of the regular legislative session. A fast-moving Senate gave unanimous approval to critical “sunset legislation” Wednesday afternoon and early Thursday morning, using two bills to extend the life of five state agencies held political hostage at the end of the regular legislative session. The special session's Senate Bill 20 and Senate Bill 60, authored by state Sen. Van Taylor, R-Plano, would reauthorize the Texas Medical Board and four other state agencies. Gov. Greg Abbott has said he won't add other hot-button items to legislators' agenda until after they keep those agencies afloat. The Senate reconvened shortly after midnight and unanimously granted final approval to both bills — just two days into the 30-day special session. 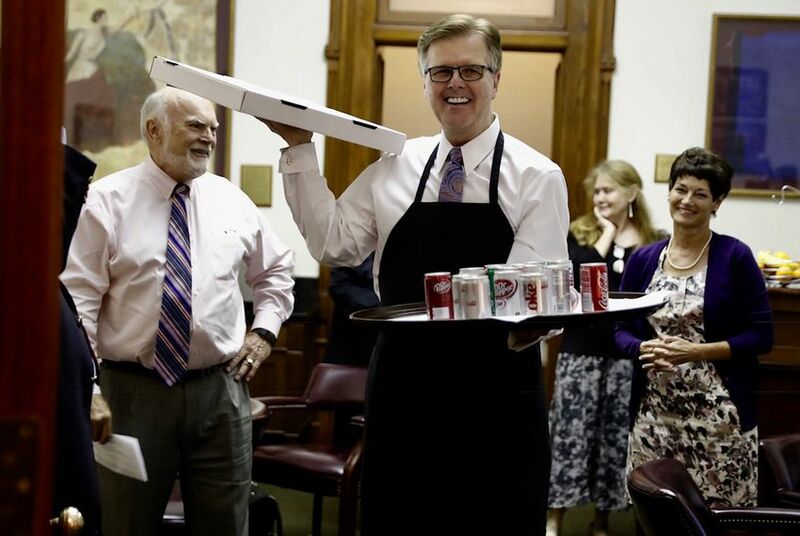 "I will bring the pizza and the soda pop," Lt. Gov. Dan Patrick joked earlier in the day. At the midnight session, he delivered both wearing an apron. The bills now head across the hall to the Texas House, which has made clear it's not motivated by a speedy timetable. Minutes after the Senate voted to pass the sunset bills, the chamber heard a proclamation from Abbott that expanded his call for the special session to include the 19 priorities he announced last month. Included on the new agenda are a host of measures about local control, as well as legislation on maternal mortality, several bills on abortion and the controversial "bathroom" bill. In one major change, Abbott appeared to broaden an item dealing with school finance. In a working draft of the call released earlier this month, he called only for a statewide commission to study the issue. In the proclamation read to the Senate early Thursday morning, the item had been expanded to include other proposals related to the issue. "The remaining 19 items are now added to the special session," Abbott tweeted minutes later. "Let the legislating begin." State Sen. Paul Bettencourt, R-Houston, said the reason for the midnight meeting was so public hearings could begin taking place as soon as Friday morning. Legislative rules require a 24-hour notice for a public hearing during a special session. Bettencourt said lawmakers made announcements Wednesday about committee hearings Friday to give "as much notice as possible." The House State Affairs committee on Wednesday approved sunset legislation of its own — House Bill 1 by Round Rock Republican Larry Gonzales — which would leave the five state agencies open for another two years. It's unclear how soon that bill will head to the full chamber. The House would also need to pass House Bill 2 to fund the agencies.